The basis of my handicapping is finding value. Unfortunately, at times, particularly in this past Saturday's Monmouth Park contest, I played a few far-fetched, extreme values, and often contemplate how to temper my affinity for anything non-chalk. Granted, the three victories got me closer only to break-even (I'm in 374th-place out of 1,162 registered handicappers at minus $175) after being in the hole by close to a mythical, repeat mythical, $3k. However, I am finding much better success in races where I have flip-flopped last minute on a pick. In tonight's contest race (Race 6), for instance, a $54k maiden special weight at a mile on wet dirt, I was instantly drawn to Preshow, a second-time starter at 3-to-1, especially after my first choice, 6-to-1 Tribal Charm, had scratched. A video replay of Preshow's first race suggested an eagerness to handle two turns after closing extremely well into a 5.5-furlong sprint on February 20. But true to form at Santa Anita, the betting public beat down the favored Preshow to a far less attractive 6-to-5, so I knew I would be looking elsewhere. Scanning the odds with 3-4 minutes to post, I was between the #5, Burton's Angel, and the #7, Team Builder, who were both around 10-to-1, enticing overlays off a 6-to-1 M/L. The deciding factors in selecting Burton's Angel, for me, were that Corey Nakatani stuck with the horse for a 5th-straight effort (a bullish indicator, in my view, and validated in his post-race comments on HRTV), the horse's ability to track front-runners (as evidenced by her first and most recent races, though admittedly she never finished within a length of any winner), and the horse's apparent versatility, having finished 3rd in races at 6.5f on the synthetic at Hollywood Park and at a mile on the Santa Anita turf. 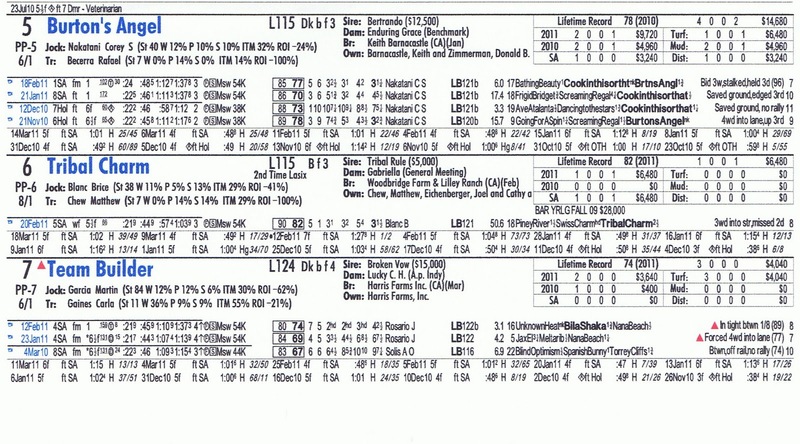 So at least this filly has been competitive. I trusted my gut that this versatility would pay off better than it would for similarly-priced Team Builder, who boasts a solid trainer in Carla Gaines (4-of-11 wins) but already a third rider in four lifetime starts, a bearish indicator for me. Plus, I was not enamored by the video replay of Team Builder's February 12 effort at a mile on the turf in a field that also featured Wednesday's 5-to-2 second choice Bila Shaka. As hoped, Burton's Angel got a dream trip, sitting a close third to front-runner Running Isabella and runner-up Bila Shaka before ultimately passing the latter in the homestretch for a length-and-a-half win, plus an $18.20 win payout for anyone who, unlike me, had real coin on the race. This is not to suggest any handicapping brilliance on my part, but rather serves as a reminder to myself, and perhaps advice to other weekend contest players, that often gut instinct and other hints of information within the PPs can prove far more valuable in a contest situation than getting too deep into the forms and overburdening ourself with information. Tomorrow brings another contest day, and I am hoping by the end of this weekend to be on the plus side of the ledger, hopefully with some fruitful long-shots. Rafael Becerra's pretty good with fresh maidens. I've always been fond of his subset of Maiden Claimers off the month rest period. I wouldn't put too much stock in the Morning Line since there were scratches and the switch to the main track that rendered the ML meaningless. Nonetheless 8/1 is generous given the fact that an even turf effort had to help Burton's Angel with the kick in the lane. That said Team Builder and Carla Gaines had just as much going for them also form-cycle wise. She's great with fresh maidens too. The story for A LOT of us I'm sure, Knight, but it's pretty refreshing (even in a fantasy contest like this) to make progress. I am now on the plus side today (+$245) after a $100S pick that was 12-1 M/L and posted at 19-1 M/L, so I hope the run continues. 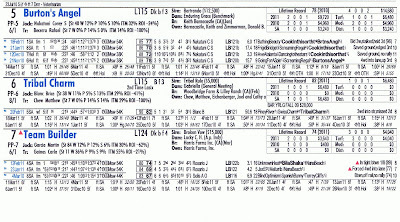 Too bad it didn't in the Monmouth contest on Saturday...ugh. There was also the "angel angle" in play...Elizabeth Taylor died that morning, she was twice married to Richard....BURTON. BURTON'S ANGEL was hunch play of the day ;-) ! Amateurcapper, that is bordering on eerie! That idea never crossed my mind.